As part of our ongoing BFSI IT research, Everest Group conducted a deep dive study of the digital rotation journeys of the top U.S. banks such as Bank of America, JP Morgan & Chase, U.S. Bank, Citibank, and Wells Fargo, among others. In this viewpoint, we present the digital journey so far for large U.S. banks and the road ahead. 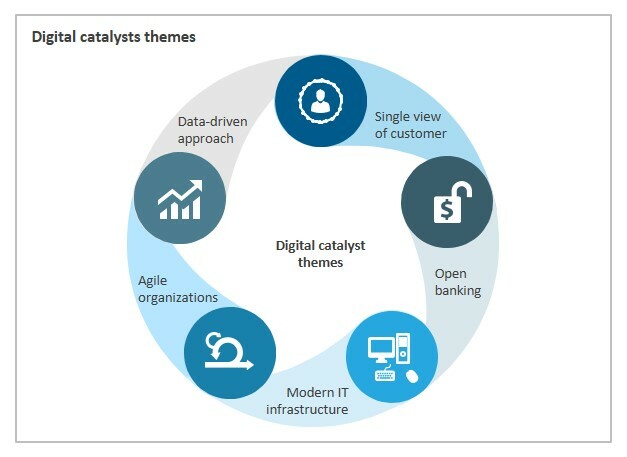 We present Everest Group’s five digital catalyst themes that banks must leverage to achieve the full potential of their digital rotation efforts. Everest Group’s five digital catalyst themes are guiding principles for banks, irrespective of their current level of maturity in their digital journey. Whether a pioneer or a beginner, this study would help you in identifying the digital enablers that can bring a true front-to-back digital transformation. Going forward, banks will need to reimagine assumptions, develop customer-focused services and transform the culture and ethos of the bank to achieve business impact. Are you able to realize the potential business outcomes from your digital investments?